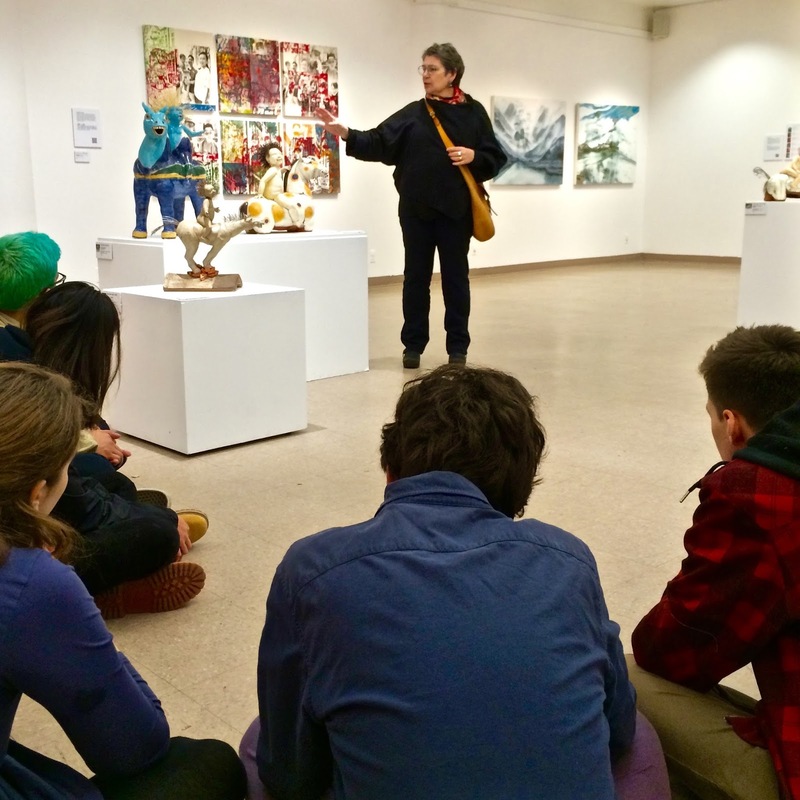 Students from Strathcona Elementary School and Britannia Secondary School visited Telling Stories: a visual art exhibition for a gallery tour led by Best B4 Collective Artists. 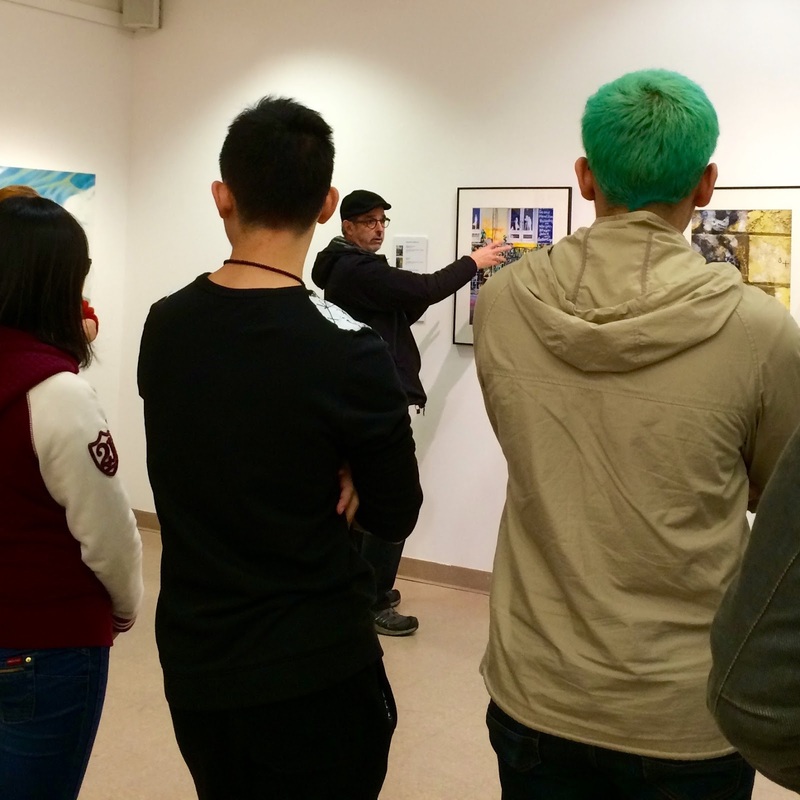 After their visit to the On-Tak Cheung Gallery in the Chinese Cultural Centre Museum, artists visited classrooms to work with students and teachers to extend storytelling into writing, photography and ceramics projects. who in turn told them stories during group interviews. In their classroom, they worked with Alison Keenan and Phyllis Schwartz to write about elders and their observations about changes in Strathcona over the years. Students in Ariel Boulet's Ceramics class worked with Debra Sloan, Alison Keenan and Phyllis Schwartz to explore slip casting and experiment with sculptural forms. 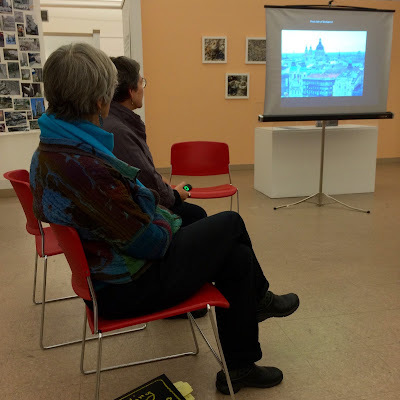 Edward Peck spoke about his Berlin graffiti project, and photography students explored the Strathcona and Commercial Drive Communities to find graffiti art as subject material for their digital photography. Student work is currently on display in the foyer at the Vancouver Schoolboard (1580 West Broadway) until the end of March. 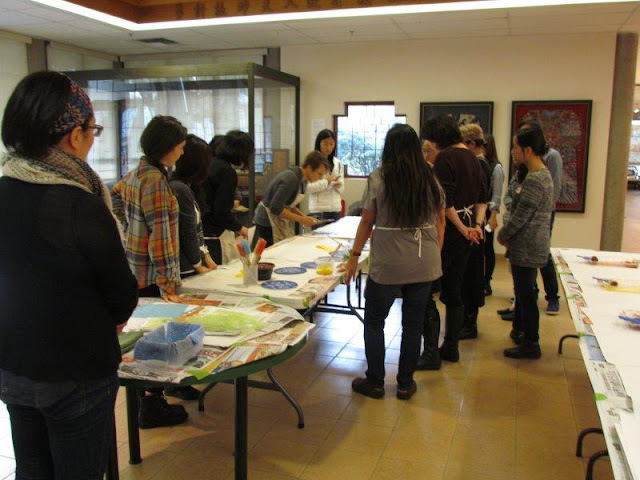 These projects were partially funded by the City of Vancouver, the Best B4 Collective, the Chinese Cultural Centre of Greater Vancouver and Vancouver School Board District Fine Arts. It's a wrap. Best B4 Collective takes a bow after enjoying a generous two months residency at the Chinese Cultural Centre Museum. 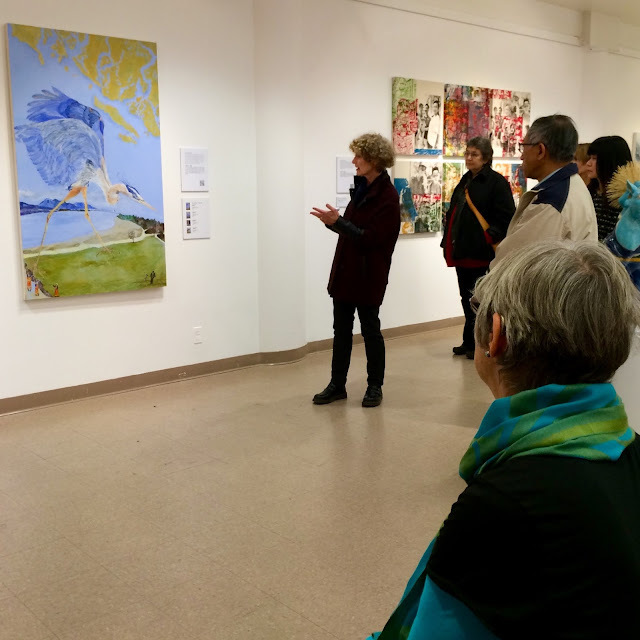 Thank you to all who visited Telling Stories: a visual exhibition, attended the opening reception, the artist talks, community events and workshops. We enjoyed many fine conversations and appreciate the comments left in our guestbook. 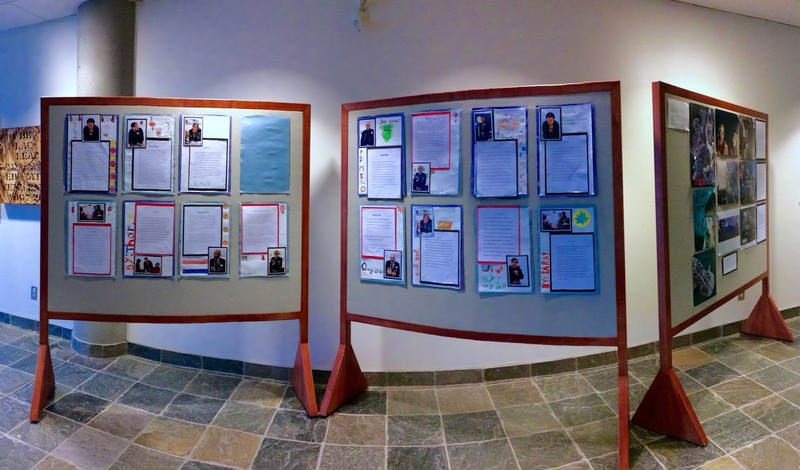 Education projects at Strathcona Elementary School and Britannia Secondary School continue through January, and student work inspired by the exhibitionwill be on display at the Vancouver School Board (1580 West Broadway) during February. Further details to come. Telling Stories: a visual exhibition can be revisted in videos made by Jian Ping Su (Shaw TV) and Andrew Davies (sixdegreeslive. BestB4 Collective Salon featured a conversation between Daphne Harwood and Debra Sloan on Sunday, 06 December in the On-Tak Cheung Gallery at the Chinese Cultural Centre of Greater Vancouver. Daphne Harwood was one of the originators of the Imagination Market, a non-profit organization that promoted the reuse and repurposing of usable industrial discards. Now the building site where the Imagination Market was has been transformed by Vancouver City Council's approval of a 52-storey tower. 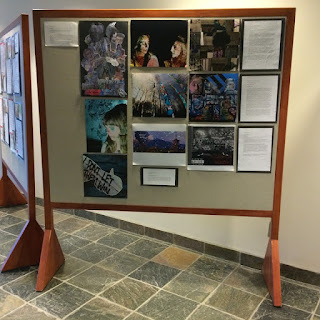 Harwood spoke about how she has been documenting this transition in photography, journaling, quilt-making and assemblage. 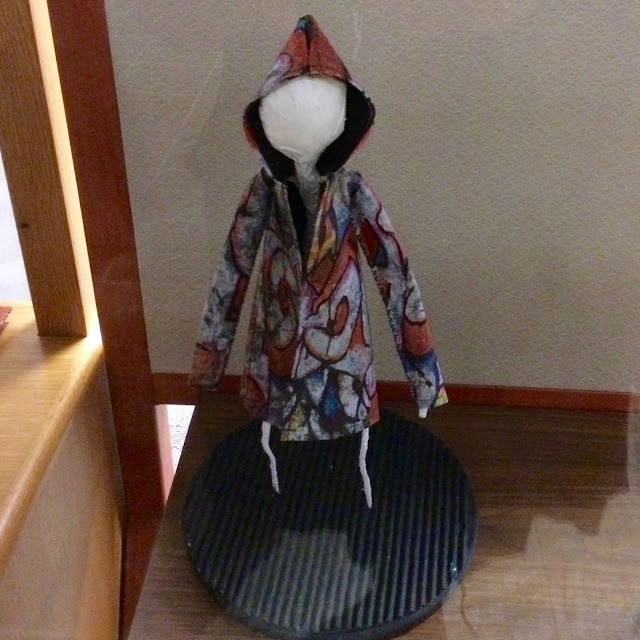 Debra Sloan is a Vancouver-based ceramic sculptor and the 2015 recipient of the Mayor's Design and Craft Award. 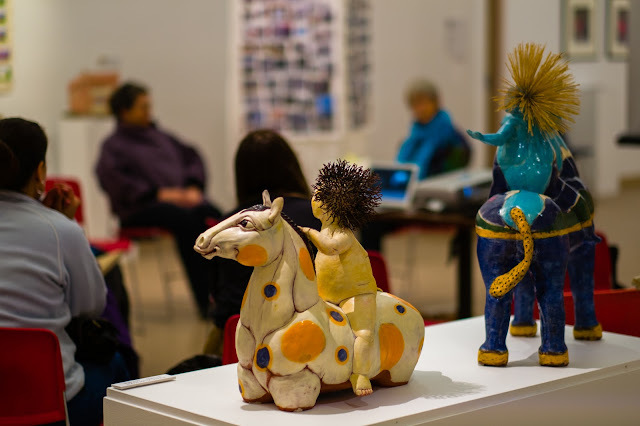 Her slip cast dogs, horses and baby figures challenge and surprise viewer assumptions and attitudes. 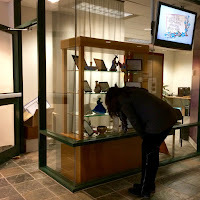 Sloan's work has been exhibited locally, across Canada and internationally, and most recently awarded the Vancouver Mayor's Art Award and biannual Hilde Gerson Award by the Craft Council of BC. 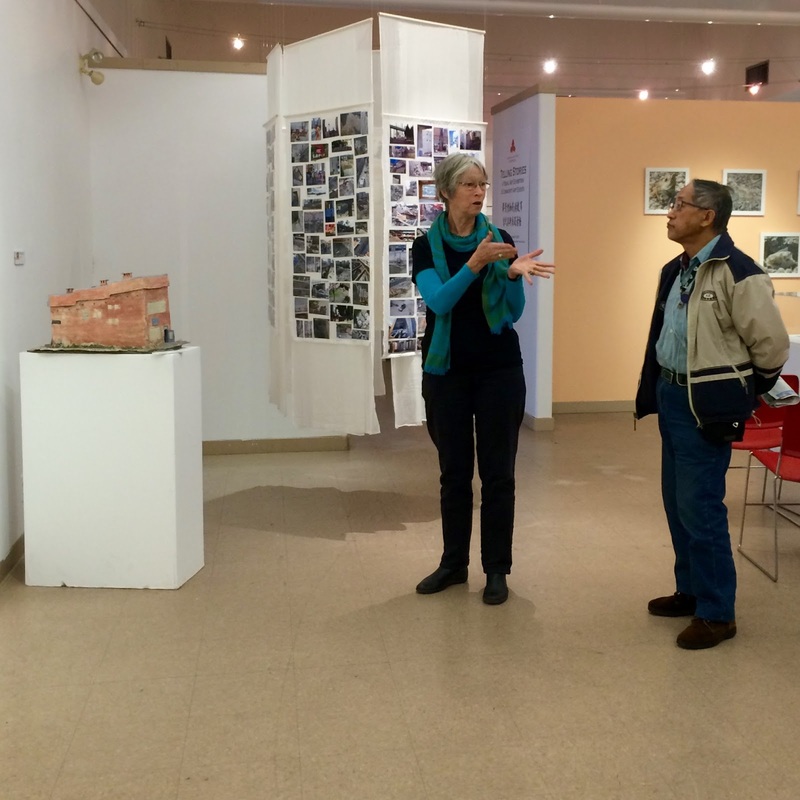 She spoke about her recent ceramic residency at C.R.E.T.A. in Rome. Both artists discussed the influence that the environment had on their artist practice and bodies of work. Debra Sloan works in ceramic residencies that offer the opportunity to research both techniques and ceramics history. 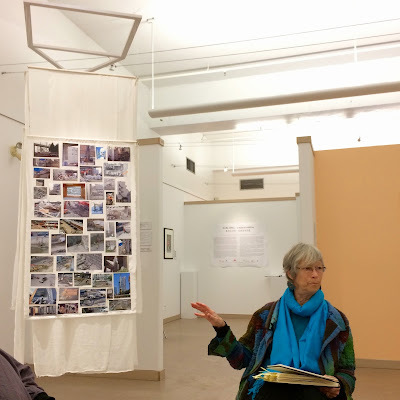 Daphne Harwood works from a documentary perspective, using journaling and photography as a starting point; her current work continues as Vancouver house progresses from the demolition of the original Imagination Market site to construction and eventually occupancy. Telling Story/a visual art exhibition continues in the On-Tak Exhibition Hall at the Chinese Cultural Centre Museum of Greater Vancouver (555 Columbia at Keefer) until Saturday, 19 December. The gallery is open Tuesday- Sunday (11 - 5 pm). 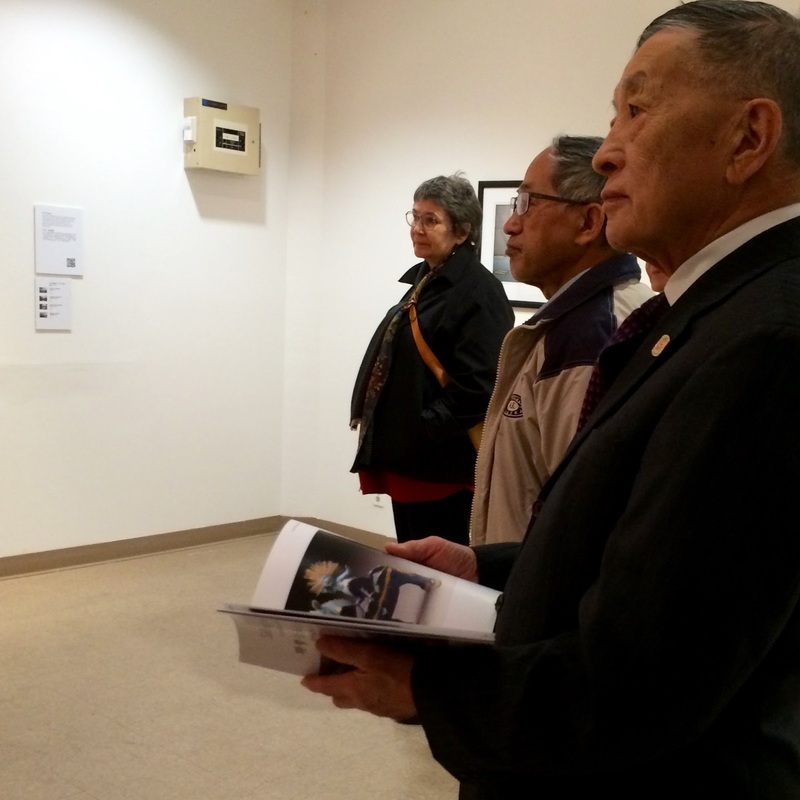 The limited edition exhibition catalogue can be purchased for $20 at the Chinese Cultural Museum. 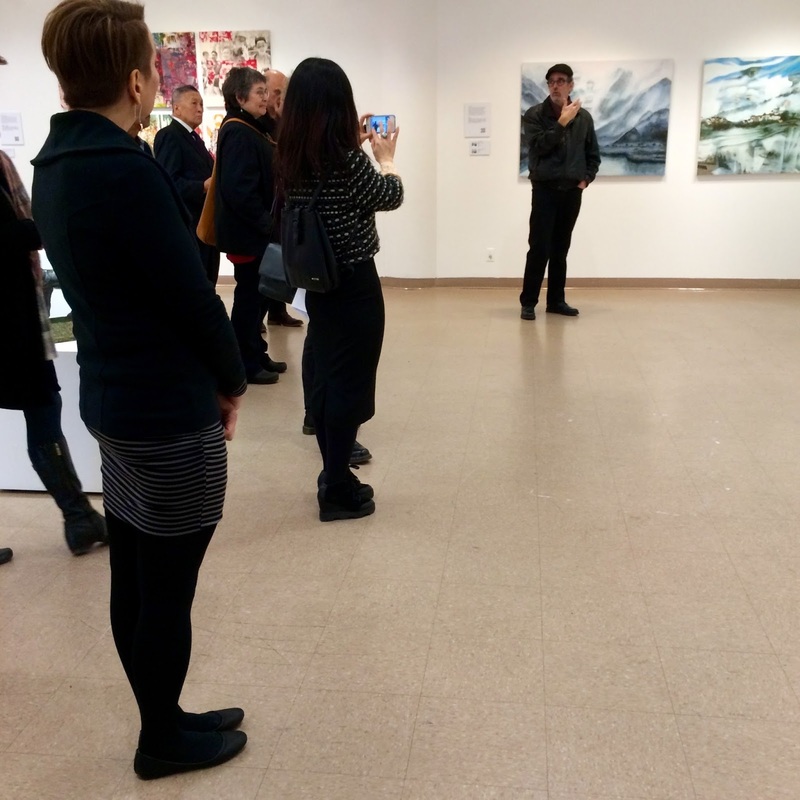 BestB4 Collective artists Jim Friesen, Daphne Harwood, Alison Keenan, Sophi Liang, Colette Lisoway, Edward Peck, Phyllis Schwartz, Debra Sloan and June Yun guided visitors through a tour of Telling Stories: A Visual Art Exhibition at the Chinese Cultural Centre Museum on Sunday 29 November. Artists told stories that enlivened their photography, painting, ceramics, fibre and installations and engaged viewers in dialogue about contemporary issues that weave together their collective exhibition. 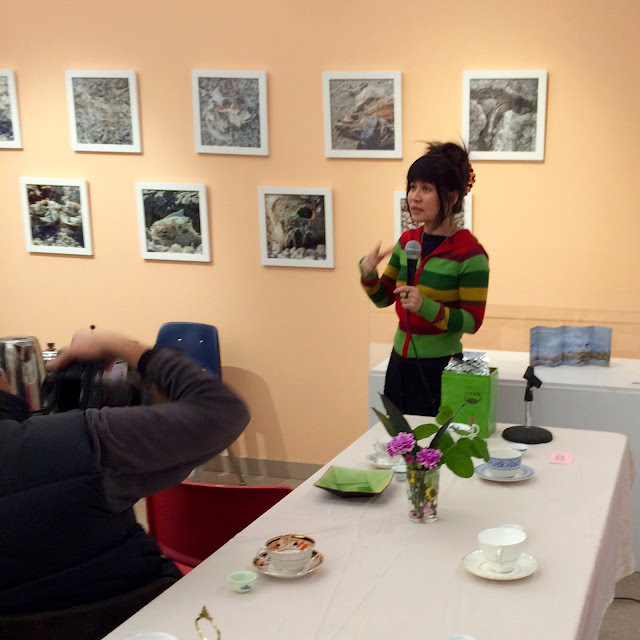 Sophi Liang, visual artist exhibiting in Telling Stories, organized an afternoon Tea and Story Party for the BestB4 Collective at the Chinese Cultural Centre Museum on Saturday, 21 November. The first of three community events included presentations by Ben Fong, tea specialist and Jim Wong-Chu, historian and poet. 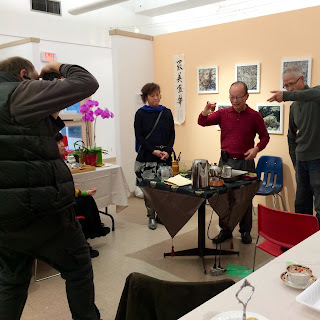 Fong demonstrated and narrated tea preparation techniques. This included several styles of tea brewing accompanied by a samples. 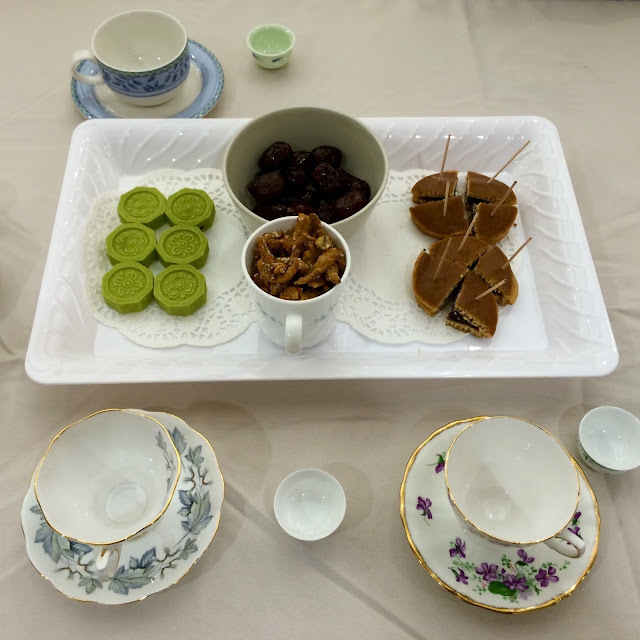 A generous assortment of tea cakes and treats were shared along with stories about the history of tea and tea culture. 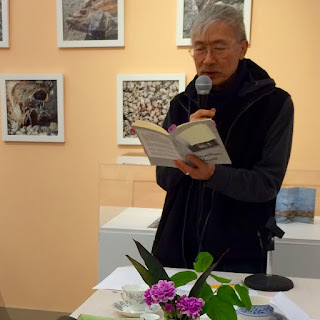 Wong-Chu read poems about Chinatown from Chinatown Ghosts, published by Pulp Arsenal Press. These poems prompted stories about Chinatown history and culture. 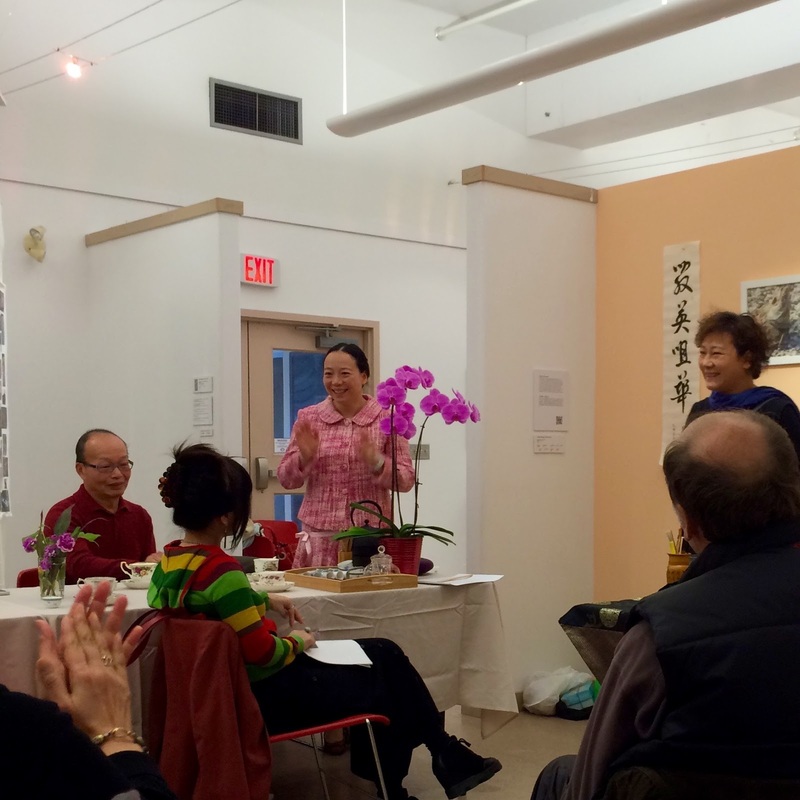 Well attended and well documented, Liang's Tea and Story Party lingered until late in the afternoon. 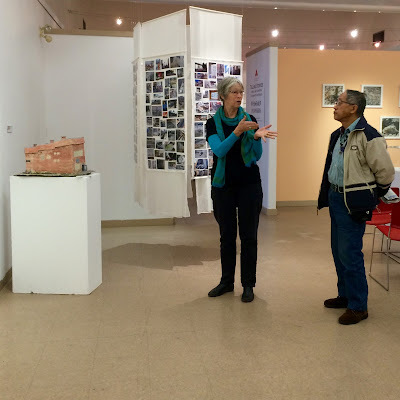 Telling Story/a visual art exhibition continues in the On-Tak Exhibition Hall at the Chinese Cultural Centre Museum of Greater Vancouver (555 Columbia at Keefer) until Saturday, 19 December. 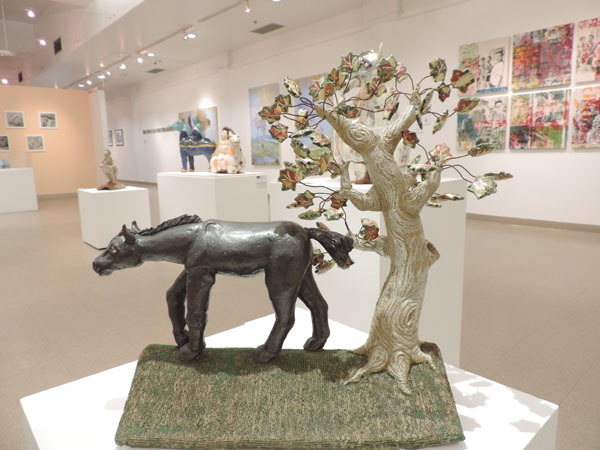 The gallery is open Tuesday- Sunday (11 - 5 pm). 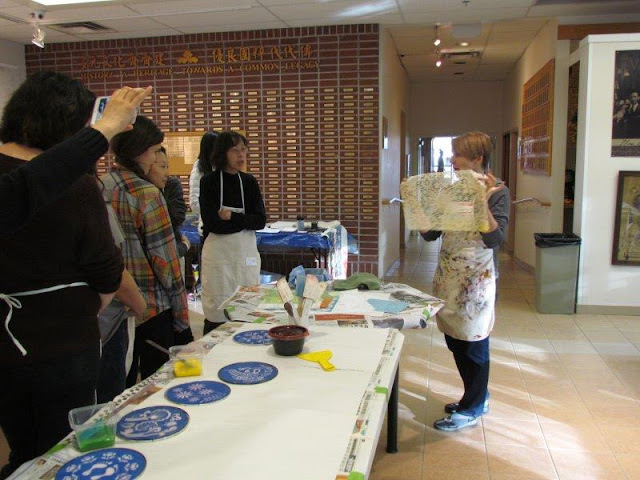 Telling Stories/a visual arts exhibition invited community to extend the exhibition through participating in workshops offered by BestB4 Collective artists Colette Lisoway (printmaking) and June Yun (Calligraphy). 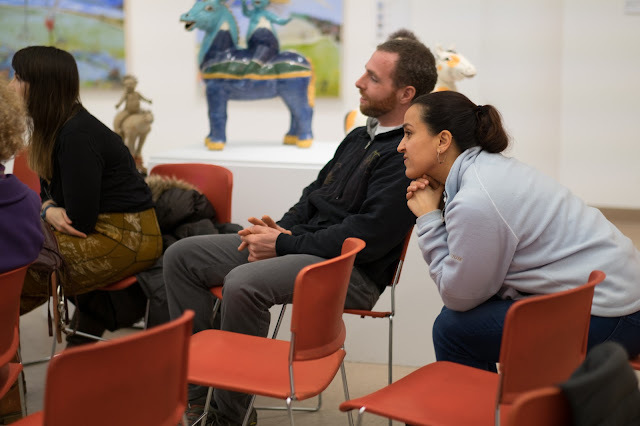 Both workshops drew sizeable crowds for afternoons of skill building and story sharing. Colette Lisoway explained the different techniques of transferring an image through a screen onto fabric or paper and also a discussion on colour. Very quickly the students loaded paint onto their screens and then the magic began. Everyone eagerly participated and at the end of the session each had an art work to take home. 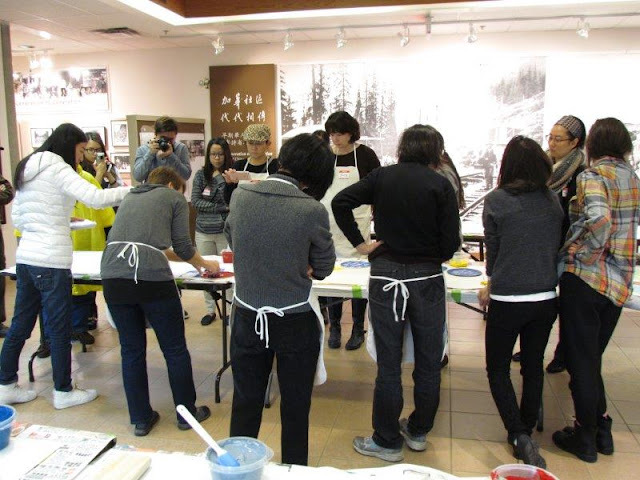 June Yun's Calligraphy Workshop introduced the four treasures: rice paper, writing brus, ink and ink slab. Her hands-on teaching approach offered participants an opportunity to learn and practice calligraphy techniques with helped to better understand Chinese art and culture. 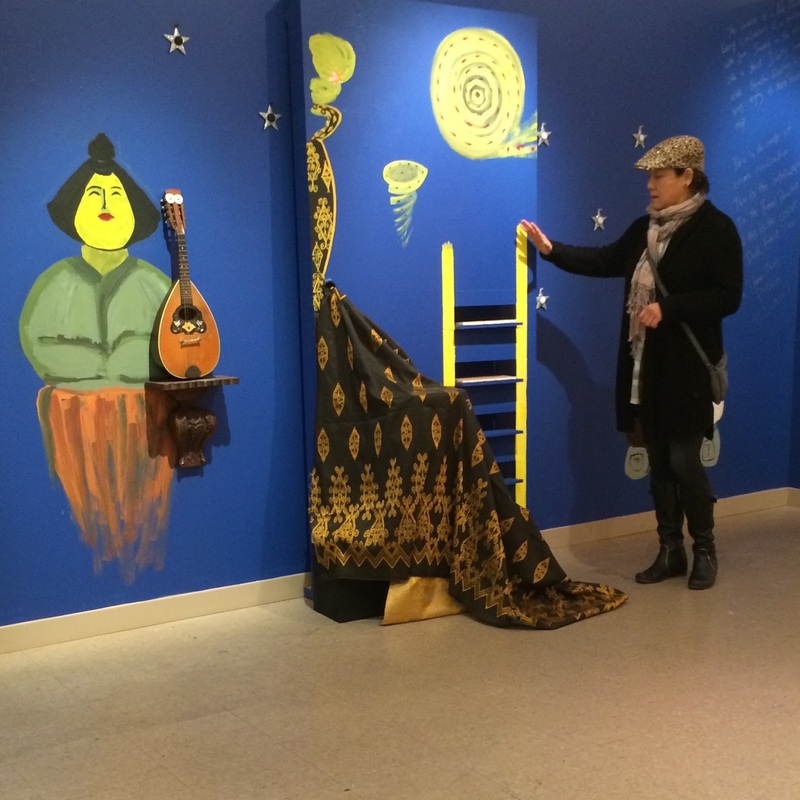 Telling Stories/a visual art exhibition continues through Saturday, 19 December in the On-Tak Cheung Gallery at the Chinese Cultural Museum (555 Columbia Street at Keefer), 11AM - 5 PM. 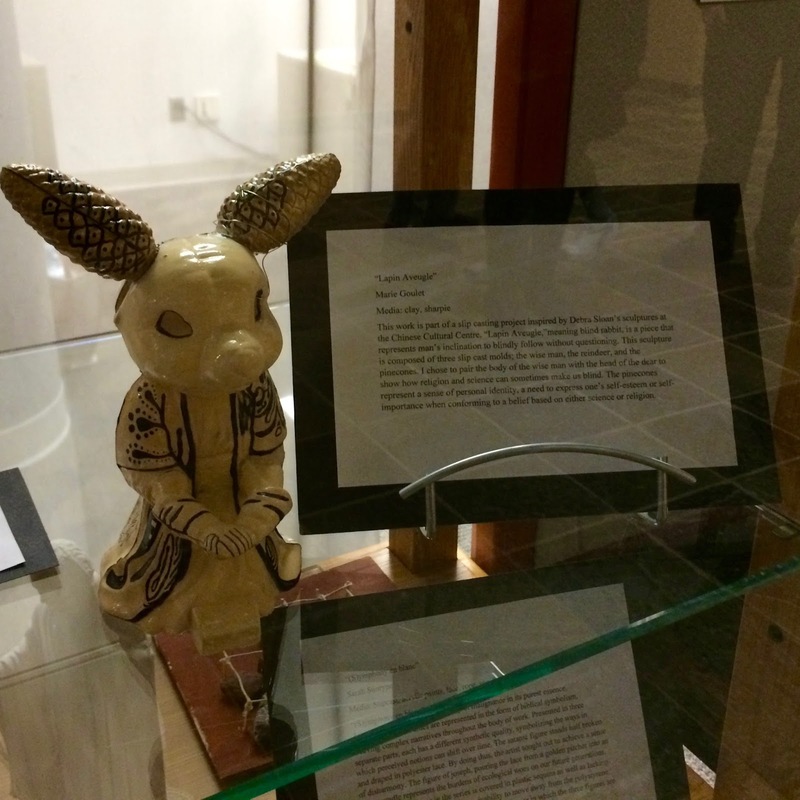 Britannia Secondary School students in Ariel Boulet's Ceramics and Photography classes visited Telling Stories/a visual art exhibition on Friday, 04 December. They were greeted by Alison Keenan and Phyllis Schwartz, curators of the exhibition, who introduced to the idea of conflict as a central storytelling element in the exhibition. Edward Peck, Jim Friesen and Debra Sloan spoke to the specifics of their work on show. Edward Peck explained the process of discovering layers of storytelling on the graffitied walls in Berlin. He quoted Dorthea Langer: "A camera is a tool for learning how to see without a camera," and illustrated the application of this quote in his work. 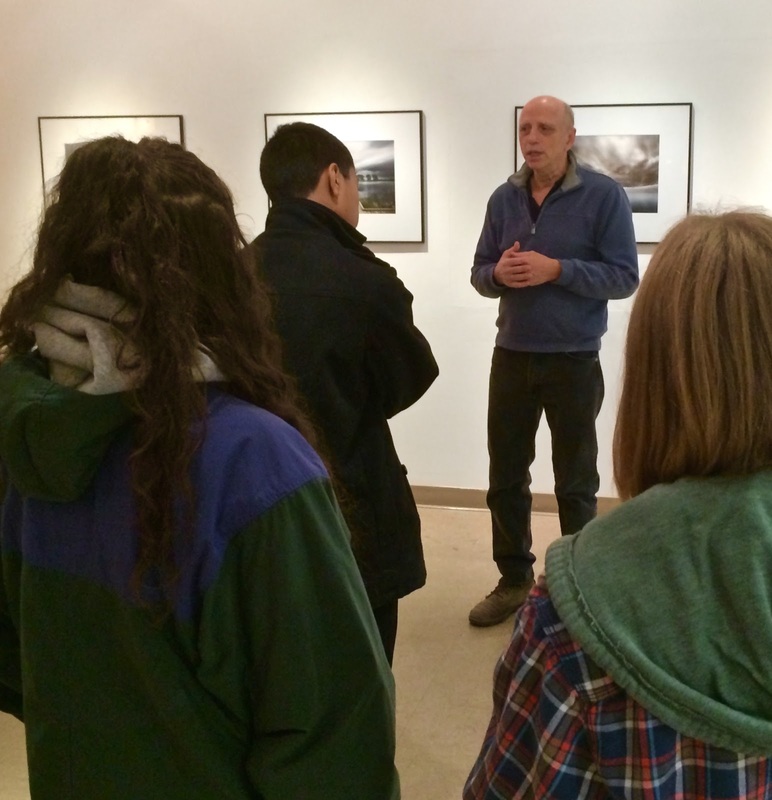 The development of his series was the focus of Jim Friesen's artist talk. He explained how he used both sequence and title to develop the concept of a mystery unfolding in his landscape photography. In his talk about The Swimmer, he spoke about both poetic and narrative elements in his imagery. Debra Sloan spoke about the sources of the stories found in her ceramic sculpture. She focussed on character and conflict. She further explained that the sculptural surface offered the opportunity to add narrative landscape elements. 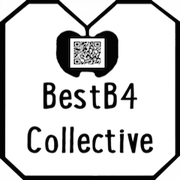 BestB4 Collective artists will continue to work with these students in their classes at Britannia Secondary School, and their work will be displayed in the foyer of the Vancouver School Board in February.